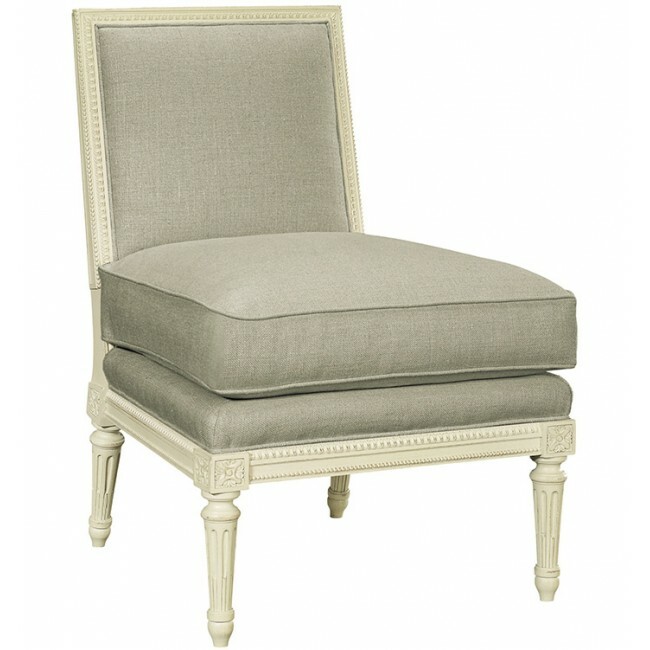 Inspired by an antique French chair, the Ansley Chair by Suzanne Kasler offers the versatility of a slipper chair with beautiful hand-carved detailing and tapered legs. Scaled for comfort, the chair works well as a pair of side chairs flanking a sofa or as a floating occasional chair. With optional nail head trim over grosgrain ribbon the pieces offers ample opportunity for custom details. Light Walnut is the standard finish. Optional Birch paint shown. Luxury Spring-Down seat cushion standard.